The Itty Bitty Kitty Committee: All Clean! Did you get it, Violet? The Small group cleans better than my two adult cats. Ditto. I want the Smalls! Oh my goodness. I just melted. That last photo turned me into a puddle. YAY for clean paws ! 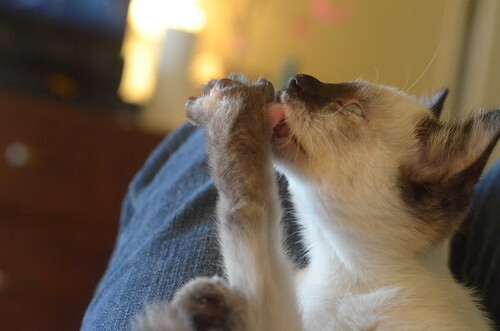 Holey cat paws Miss Violet is adorable and very skilled with her paw cleaning. awww i love splayed out kitty toes! The darling Darlings owned my heart as the cutest litter ever for a very long time. Then the napping Lamms pushed their way in, and now the small Smalls have joined too. Perhaps my heart is expanding like the Grinch's did? I honestly don't know how you do it, Laurie -- every litter you bring home is more adorable than the last. At this point the squeee! factor is off the charts! 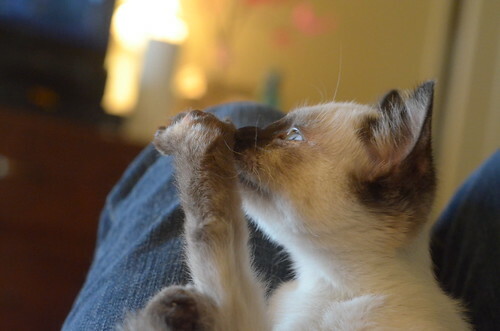 Precious baby Siamese toe beans -- does the universe get ANY cuter??? SO precious and intense. Quite agile, too. 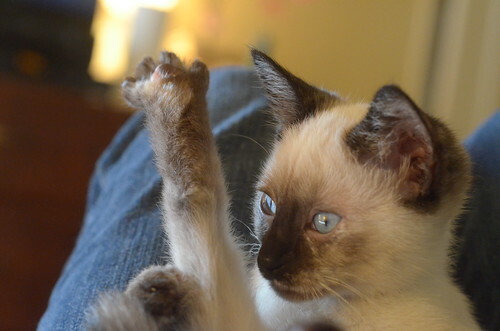 She also seems very good at the kitteh yoga. Laurie, how you get anything done is beyond me . . . I love her very determined look in the second to last picture - no paw would dare stay dirty in the presence of Miss Violet! Miss Violet is so fastidious. Lovely lil girl. AHHHH! That leg!!!!!!!!!!! Needs kisses immediately!!!!! 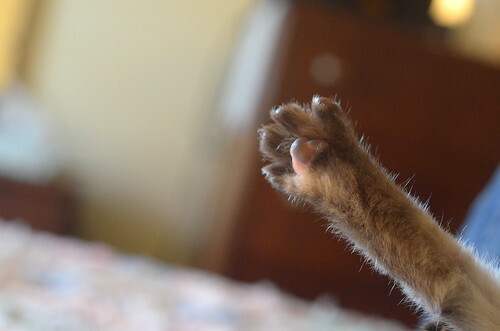 Nothing like a super skinny kitten leg with a "flower paw" at the end. Nothing. ahhhh this is so funny! hahahah!